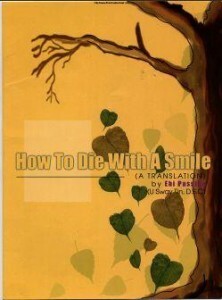 How to die with a smile. Maha Thera, the Mogok Sayadaw, Agamahapandita, delivered the following sermon at the Buddhist Mingala Monastery, Amarapura, in Upper Myanmar (Burma) in 1960. This sermon was recorded on magnetic tape and later transcribed and printed in book form, together with other sermons of the series. This sermon, has also been reprinted in booklet form, and is translated in its entirety, at the behest of the publisher by U Sway Tin, beginning January 8, 1997 at Yangon. This sermon was recorded on magnetic tape and later transcribed and printed in book form, together with other sermons of the series.